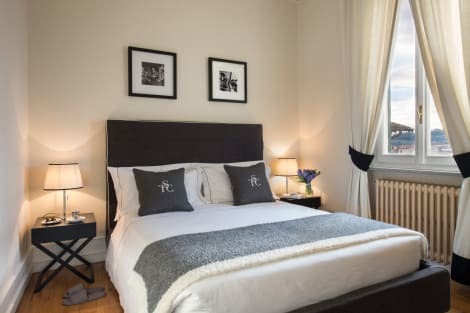 The 4-star luxury Tornabuoni Suites Collection is located in the heart of Florence, close to the famed Ponte Vecchio, Florence Cathedral and Piazza della Signoria square. Within each air-conditioned suite guests will find a seating area, flatscreen TV, safe and fully equipped kitchen. Free wi-fi is accessible throughout. Private parking is available for guests for a small fee and an airport shuttle service provides affordable transport directly from the hotel’s reception. 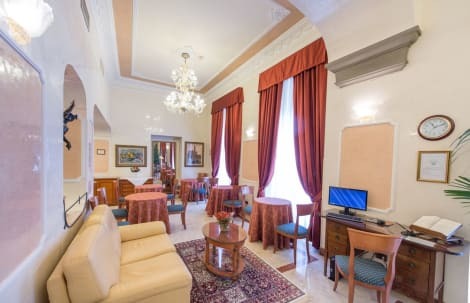 The hotel is composed by two Renaissance buildings, the main building Palazzo Minerbetti and the palazo Strozzi where the rooms are located at the top floor only and are linked to the main building via a corridor. It is worth to admire the facades. Featured amenities include express check-in, express check-out, and complimentary newspapers in the lobby. A roundtrip airport shuttle is provided for a surcharge (available on request), and self parking (subject to charges) is available onsite. The 4-star Hotel Berchielli Florence is a stunning property, boasting breathtaking views of the Arno River and moments from Ponte Vecchio and Piazza della Signoria. The spacious rooms are classically furnished, equipped with free wi-fi access, LCD TVs and air conditioning – ideal for relaxing in the shade before adventuring out into the city. A nutritious breakfast buffet is available each morning, and staff at the 24-hour front desk are happy to provide information about the local area. Chic and classy, the 4-star Hotel Roma in the heart of Florence’s historical centre, overlooks the beautiful Piazza Santa Maria Novella square. Each elegant room is fitted with air conditioning, cable TV and wi-fi access. Within the beautiful 18th-century building, you can visit the American Bar for a drink and a snack before you head up to your room. In the morning feast on the buffet breakfast and enjoy a fine Italian coffee to start your day.